You can fake the menu-flyout-on-hover effect using the first option, a hyperlink to another slide. First, watch how it looks. Create a slide by inserting the objects you want to hover over. Here’s the first slide. In this case, I inserted two objects. Each object will hyperlink to its own slide when you hover the cursor over it, so this project needs two additional slides. Duplicate the first slide as many times as you need for your situation. Each slide then has the original shapes in the same location. This is important for the seamless look of the menu; the fact that you’re going to another slide won’t be obvious. These slides need the pop-up object on them. As you can see, I’ve added another shape, with the answer to the questions. I also added a Return shape which will hyperlink to the first slide with the questions. These are slides 2 and 3. Return to the first slide and select the shape that you want to hover over. Go to Insert tab> Links group> Action. (In PowerPoint 2003, go to Slide Show> Action Settings) In the Action Settings dialog box, click the Mouse Over tab. Make sure you’re on the Mouse Over tab for each hyperlink you add, because it isn’t the default tab. Select the Hyperlink To option. Then choose the appropriate slide from the drop-down list. For the first shape, I chose Next Slide as you see above. Click OK to create the hyperlink. For the second shape, I chose Slide, which opened a list of slides; there I chose the 3rd slide. For the Return shape on Slide 2, I chose Last Slide Viewed. Then I copied and pasted that to Slide 3. To create the effect of the second shape sliding down from the first, you use animation. Go to the second slide and select the shape you added. In PowerPoint 2010, go to Animations tab> Add Animation. 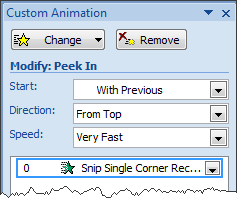 In 2007, go to Animations tab> Custom Animation to open the Animation task pane. (In PowerPoint 2003, choose Slide Show> Custom Animation.) In the Custom Animation task pane, choose Add Effect> Entrance> More Effects (if Peek In isn’t on the list)> Peek In. Click OK if you opened the Add Entrance Effect dialog box. Save and go into Slide Show View. Hover the mouse over the shape on Slide 1. You’ll go to Slide 2, but because it’s the same as Slide 1 except for the Peek In animation, it seems as if the second shape slides down on the original slide. Hover your cursor over the Return button. This returns you to Slide 1. Test any other shapes and effects that you created. Like it? Download the presentation. Would’nt be the same to use the trigger action on the animation of the objects instead of a hyperlink? I like the dropdown effect. I’m working in PowerPoint 2003. However, I note that after the first time the Mouse-over is effected, (when the animation appears as expected), returning to the first slide and then Mousing over the object does not repeat the Peek In effect, the object simply appears. Yes, but you would have to click. Usually, that’s fine, and then you can do the animation on the same slide. Good catch! It’s due to the fact that PowerPoint doesn’t replay animation (or recognize timing or other effects) when you show the same slide a second time. I have a workaround here: http://www.ellenfinkelstein.com/pptblog/create-hyperlinks-in-a-timed-presentation/. I should update that tip to say that it applies to animation as well as timing. I wasn’t able to leave a comment on the ‘Create a pop-up window’ tutorial. Allow me to do it here. When one creates a pop-up window effect using this method, the pop-up window stays there throughout the duration of the slide because, the only option seems to be to select Hide After animation in the Effect Options dialog. Is there a way to hide the pop-up on the next click? I have an amimated checkmark flying in from the right on a powerpoint slide indicating the correct answer to a quiz question in a powerpoint presentation. But the checkmark also shows up in the pdf file I create as a handout from the powerpoint for the students. How to I have the checkmark continue animate in the slide but not show up on the printed materials? This is a problem that many people have. I don’t know of an easy solution. I think that what most people do is create a duplicate presentation, without the animated object. If anyone else has a better solution, let us know! 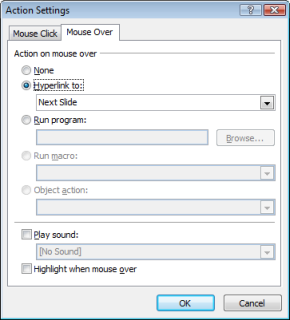 I am trying to make a hover over happen, but am using Powerpoint 2010 and the ‘Action Settings’ seems to have disappeared from the right mouse click. Tom, with the shape selected, go to the Insert tab. In the Links group, choose Action. Brilliant tip – while trying it out, I worked out that it is possible to make it more “Amazon” like. If you put a slide-sized shape, with the same colour as the background (ie, it’s effectively invisible), you can hyperlink it back to the previous slide when the mouse hovers over it. So if the mouse leaves, say, the menu on the second slide (in your example it’s an answer to a question) then it automatically returns to the previous slide. Thank You for the tip, i’ve been looking for this option the whole week. It’s very helpful. I was wanting to do a hover box in PowerPoint 2010 and stumbled across your website. Then as I thought about it more, I figured out how to do a work around that makes it seem exactly like you created a hover box. In my case, I have a scripture reference and I wanted the entire scripture to pop-up in a hover box if the scripture reference was clicked on or moused over. So I created an identical slide and put it at the end of my presentation and hyper-linked the scripture reference to this slide. I created a text box on that slide to look like a hover box with the entire scripture printed in the box. At the top right hand corner of the text/hover box I put the word “Close” and hyper-linked it back to the original slide. So now when I click on the scripture reference it hyperlinks to the slide with the hover box and when you click “Close” on the hover box,it hyperlinks back to the slide without the box. Clear as mud? I hope this helps someone. Hi Ellen, Thanks for your comment. Yes, it does seem similar to the custom show concept. I had never heard of that feature. What a great feature to create a flexible presentation, if you’re not sure how long your presentation will take. I was looking for a hover over solution. Many thanks. Great tip. I have been able to built a hover effect with 3 options – to 3 different slides – so far so good. My question is, how to I advance past it? If I “click” to advance to the next slide it takes me into the slides I built for the hover. In a nutshell, my slide with “hover options” is slide 4, if you hover over object 1, you go to slide 5. I created a hover that will bring you back to 4. If you hover over object 2, it takes you to slide 6 (with a hover to return to 4). If you hover over object 3 it takes you to slide 7 (with a hover object to return to slide 4). But, when I am done with my hovering and want to move to slide 8, if I left click, or arrow next, I got to slide 5. How to I get from 4 to 9? Sheryl — In your examlple, select slides 5, 6 and 7. Right-click and select “Hide Slide”. This will make Slide Show ignore the hidden slides when you advance normally from Slide 4. @Sheryl: Going from 4-9 is simple by just “hiding” the additional 5-8 hover pages. 5-8 will then only appear by links on p 4. This also menans you can simply unhide one of the hover pages if you want it to be a part of the presentation. Any better ideas to create a more flexible presentation? you guys can do the screen tip to diplay amount etc. just dont click it. The account apt is very swell detailed, got so a lot noesis hither. If you need to add two audios for Slide 2 and Slide 3, and set them to play automatically. 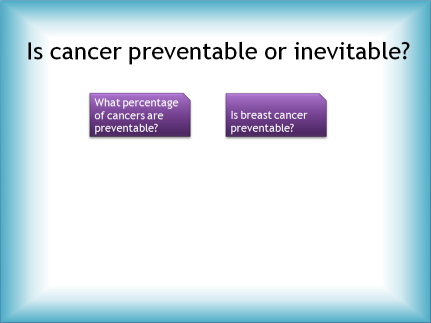 If you hover your pointer over “What percentage of cancers are preventable?”, it will be transitioned to slide 2, and the audio inserted on slide 2 will be played automatically. Then if you hover your pointer over “Is breast cancer preventable”, it will be transitioned to slide 3, and the audio inserted on slide 3 will be played automatically. However, there is no way to let the audio on Slide 2 or Slide 3 play again unless you close the presentation and reopen it, right?